What can happen in the result? What are fundamental and new knowledge in this area? Because the existing "disciplinary" system is largely obsolete, since it is similar to the principle of separate nutrition, when, as you know, proteins, fats, carbohydrates and vitamins are consumed separately from each other. However, human physiology is one where the digestive system processes mixed food much more efficiently than separated elements. The same is about food for thoughts. Human brain assimilates related information more actively and productively; and on the contrary, brain learns homogeneous information poorer, because it does not know where it must be "sent for storage". What do you need to conduct a case-lesson? 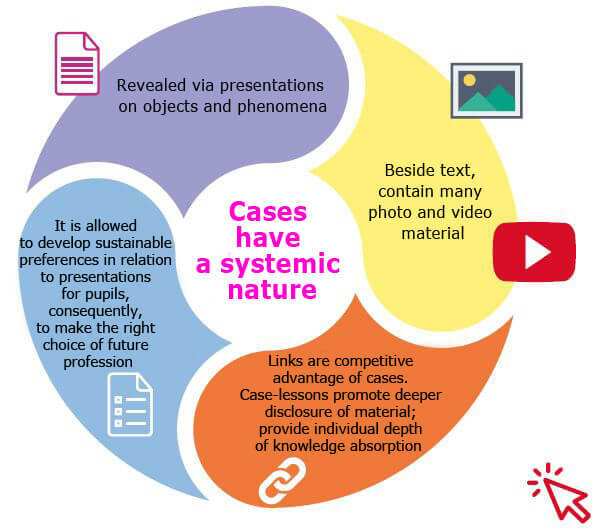 7W ® case-lessons combine a set of curriculum disciplines. For instance 'Smartphone': physics, chemistry, literacy, business, information, math, art, etc. So it falls into memory as a neural connections that increases remembering and understanding of learning issue. The combination of theoretical and practical in 'one bottle' gives excellent results. 75% of teachers note that case-lessons improve educational activity and get better remembering. 69% of the students note that cases are more intriguing and fascinating than ordinary text books. How do cases develop soft skills and competences? Case-lessons along with studying of various topics allow involving pupils’ soft skills smoothly. This is a creative method with intrigue, drama, script and choices, which is impossible to achieve in standard classes. Discussions which arise when working with case studies are of special value. When developing a case-lessons time flies, which positively affects motivation of pupils and their desire to study other case studies. It is also important that the result of studying is laid in a long-term memory. This is due to associative thinking and formal and informal relations between the studied presentations. Cases are used very active in some countries. For example, in Ukraine.